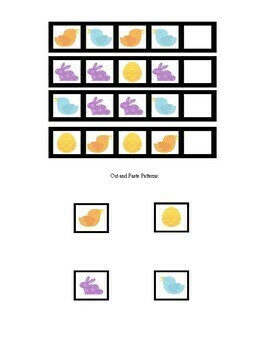 This Easter Math packet includes two number line puzzles, Easter patterns, and Easter egg number puzzles. One number line puzzle is numbered 1 – 10; the other number line puzzle is numbered 11 – 20. Laminate; cut along the vertical lines; allow the children to put the puzzles together by lining up the numbers in correct numerical order. For the Easter patterns, cut out the cut and paste patterns. Give the cut-out patterns to the children along with the pattern page. Allow the children to paste the correct missing pattern. 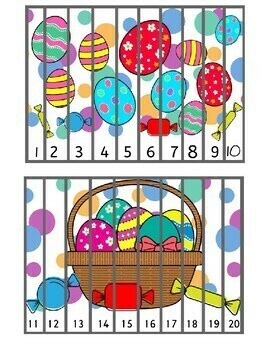 For the Easter egg number puzzles, laminate the pages; cut out the puzzle pieces; allow the children to put the puzzles together. The puzzles contain a number word and the amount of Easter eggs matching that number on one side; the puzzles also contain a number and dice with the correct number of dots. This provides children with many opportunities to count and learn numbers. 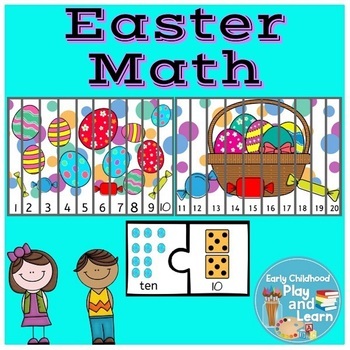 They may see the numbers and number words; they may count the dots on the dice, and they may count the Easter eggs to find the puzzle matches. 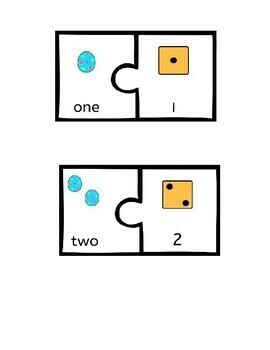 These puzzles are for numbers 1 -10. There is one page worth of number line puzzles, one page worth of Easter patterns, and five pages worth of Easter egg number puzzles.